Geocachers, don’t miss the 2017 Discover L&A County Geocaching Event, happening on August 19th, 2017! We've attracted thousands of geocachers to Lennox & Addington County since our first event in 2011. Last year, more than 1,000 geocachers from around the world attended L&A's fourth consecutive MEGA Event. This year marks our 5th MEGA Anniversary, so we have some great things planned throughout the week! The highly-anticipated Discover L&A County Geocaching Event is on Saturday, August 19th! Home base for the event is once again at Southview Public School in Napanee! Hop aboard a bus and head to the Lennox & Addington Dark Sky Viewing Area. Upon arrival you'll hear from one of Canada’s leading amateur astronomers (and L&A County resident) Terence Dickinson. Weather permitting, he'll provide an entertaining laser guided tour of the universe and will have his telescope available for viewing. Take a bus tour to several impressive Lennox & Addington County historic sites. You'll learn about our rich history at the L&A County Museum & Archives, the Allan Macpherson House, the Fairfield-Gutzeit House, the War of 1812 Discover Centre, and Fairfield House. Take a fun bus tour around L&A with stops at our award-winning wineries, cider houses, and microbreweries. You'll visit The Napanee Beer Company, Bergeron Estate Winery & Cider Company, Thirty Three Vines Winery & MacKinnon Brothers Brewing Company. Each stop will provide a sample of their product. A taxi service will be available at the end of the tour, if needed ($). Please drink responsibly. Go for a paddle tour along a river in beautiful Stone Mills Township. We're hiding some new water-accessible caches along the shoreline. Don't forget your camera, as I'm sure we'll run into some wildlife! Various canoes and kayaks are available to rent for the day. The 5th annual MEGA Kick-Off Party is taking place once again at Conservation Park in Napanee. Catch up with old friends, make some new ones, hear great live music, and get primed for an amazing weekend of geocaching. Saturday, August 19th... MEGA DAY! A full day of geocaching can give you quite the appetite! Just steps away from the event venue at the Napanee Golf & Country Club, you’ll enjoy barbecue chicken, potatoes, veggies and dessert for only $15 per person for adults & $10 for kids 10 and under. Only 100 tickets are available (pre-order only) so buy now to avoid disappointment! Canada turns 150 in 2017 and celebrations are happening across the country. 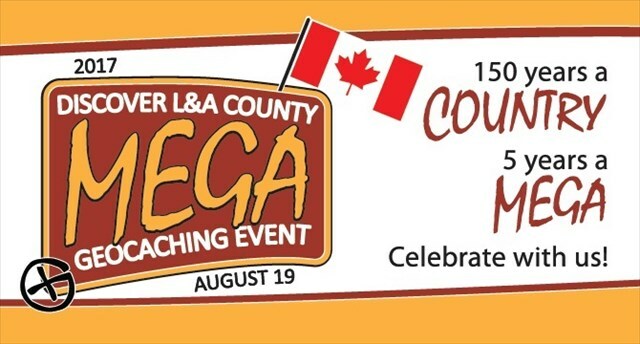 Luckily for geocachers in town for the MEGA, Lennox & Addington's big celebration is on Saturday, August 19th in Napanee! Everyone is invited for an evening of free entertainment, including live performances from the Irish Descendants and Circus Orange. Join the thousands of spectators for an unforgettable evening in Lennox & Addington. Please log your 'WILL ATTEND' if you’re able to make it to the 2017 Discover L&A County Geocaching Event. Also, be sure to visit www.LandAGeocaching.com or www.facebook.com/LandAGeocaching for news, updates and information about 'all things geocaching' in Lennox & Addington County. We’ll see you in August!